Supporters of Ecuador's President Rafael Correa celebrate his return following defeat of the attempted coup. October 26, 2010 -- Polecon.net -- It is not difficult to see that the events of September 30, in the Latin American country of Ecuador, amounted to an attempted right-wing coup d’état. Mass mobilisations in the streets and plazas of Quito (the capital) and other cities – in conjunction with action by sections of the armed forces which stayed loyal to the government – stopped the coup before the day was out. But those few hours highlighted, again, the deep dangers facing those fighting for progressive change in Latin America and the Caribbean. Remarkably, the first task is to re-assert that in fact a coup attempt took place. In the wake of the failure of the coup, commentator after commentator was trying to minimise what happened. Peruvian “libertarian” Álvaro Vargas Llosa – darling of the World Economic Forum and outspoken critic of Che Guevara and the current governments of Bolivia and Venezuela – insists that it was not a coup just an “ill-advised, violent protest by the police against a law that cut their benefits”. Let us examine the facts. Rafael Correa is the democratically elected president of the country, re-elected in 2009 winning 51.99 per cent of votes cast, on a turnout of almost 75 per cent (in an electorate of more than 10 million people). His nearest rival – ex-president and oil company friend Lucio Gutierrez – received just 28.24 per cent of the vote. September 30 – thousands of police rebelled, taking control of several cities, shutting down roads and airports. In the capital city, Quito, they took over their barracks. When President Correa went to the main barracks to confront the police, he was attacked with tear gas and injured. He was allowed to go for treatment in a police hospital, but confined there for 12 hours until rescued – after a “fierce gun battle” (according to Atilio A. Boron), which resulted in the death of two policemen (including the police sergeant protecting Correa), a soldier and a student. During these tense hours, there was a rebellion in sections of the armed forces (members of the Ecuadoran air force took over and shut down Quito’s international airport) and anti-Correa political figures – including the lawyer for defeated presidential candidate Gutierrez – tried to force their way into the buildings of Ecuador National Television. When the democratically elected president of a country is attacked, injured and confined against his will: when police take over towns and sections of the air force take over and close the country’s major airport: when pro-business political figures try to storm the national television statement – that is called an attempted coup d’état. If it were to happen in Ottawa, Washington or London, there would be no dispute. A photograph accompanying an important article by Mark Weisbrot (co-writer of Oliver Stone’s South of the Border) showed masses of people taking to the streets of Quito to defend Correa. In the article, Weisbrot persuasively argued that “to anyone who watched the prolonged, pitched gun-battle on TV last night, when the armed forces finally rescued President Correa from the hospital where he was trapped by the police” this could only be seen as an attempted coup, “an attempt to overthrow the government”. The reason there is a bizarre attempt to pretend that this coup attempt never happened, is to hope that people won’t ask who might have benefited from such an action. A quick examination of the actions of President Correa sheds considerable light on that. In 2006, working with President Hugo Chávez of Venezuela, Correa moved to increase state control over oil production in the country. In 2008, he announced that Ecuador would not pay several billions of its more than $10 billion foreign debt, calling it “illegitimate”. In 2009, he refused to renew the lease of the US military airbase in Manta, saying that “the only way the US could keep their military base in Ecuador, is if Ecuador were allowed to have one of its own in Florida”. In 2009, he officially brought Ecuador into ALBA – the Bolivarian Alliance for the Americas led by Venezuela, Cuba and Bolivia. When a country increases state control, challenges illegitimate foreign debt, pushes the US military out of the country and joins a regional alliance with Venezuela, Bolivia and Cuba – it is clear that the forces that would benefit from a coup would be: a) corporate interests inside Ecuador; b) international financial institutions; and c) the United States and its allies. There is another reason why the right-wing, corporate elite and the imperialist countries might have an incentive to minimise what happened September 30. There is now a shamefully long list of recent coup attempts in Latin America and the Caribbean – four of them against members of ALBA. April 2002, President Chávez of Venezuela was briefly taken into exile in a coup d’état which was stopped when 1 million of his supporters surrounded the presidential palace. February 2004, President Jean-Bertrand Aristide was forcibly overthrown in a coup backed by the military forces of Canada, the United States and France. September 2008, in the Santa Cruz area of Bolivia, right-wing forces used armed fascist gangs to try and break the hold of President Evo Morales. They were stopped through a combination of mass mobilisations, and the intervention by loyal sections of the armed forces. June 2009, Honduran President Manuel Zelaya was overthrown by the military. All but Haiti were members of ALBA – and one of the main acts of the coup regime in Honduras was to withdraw from ALBA. It is not, therefore, an exaggeration to say that the coup attempt in Ecuador is the latest in a series of violent attempts to roll back the anti-neoliberal movement, whose main institutional shape is represented by the ALBA countries. The dangers facing the anti-neoliberal movement, and the region, were also highlighted by the results of National Assembly elections in Venezuela. At one level, they represent a remarkable achievement – the United Socialist Party of Venezuela (PSUV) topping the polls and winning 98 seats out of 165. But within that victory, there were troubling signs. First while the PSUV won more than 5million votes in both the nationwide vote for the Latin American parliament and the state-wide party lists, its right-wing rival, the Democratic Unity Roundtable (MUD) also topped 5 million in both votes, trailing the PSUV by around 200,000. Second – key states along the border of Colombia (the principal base for the US military in the region) fell to the MUD. Finally – while 98 seats is a majority, it is short of the two-thirds majority necessary for key constitutional changes. Important advances – such as creating a favourable legislative framework for workers’ control of industry – will be much more difficult. There is disillusionment in sections of the base of the PSUV. The recession hit Venezuela harder than many other countries in Latin America. The old state bureaucracy is still largely intact (and quite reluctant to support Chávez’ reforms), and the bulk of the media remains in the hands of the right wing. In addition – while the PSUV has been a remarkable school in politics for millions of people – it has also been a source of career advancement for a few thousand. Nepotism and bureaucratic tendencies have become a drag on many of the reform projects launched by the regime. CONAIE’s importance in the social movements in Ecuador is not to be doubted. Its mobilisation of the Indigenous community has been a key factor in the social advances made in Ecuador this century. And Correa has not always been an easy president to defend. In 2009, CONAIE was involved in a “week of marches and road blockades” in protest against certain of Correa’s policies. At issue were “the autonomy of the indigenous bilingual education system”, the new water law and the new mining law passed in January 2009 which CONAIE has “appealed before the Constitutional Court”. But even with legitimate grievances against Correa, it is clearly a mistake for CONAIE to minimize the dangers represented by the September 30 events. Global North solidarity activists need to be aware of internal conflicts in the ALBA countries, take them very seriously, and try to sort out our attitude towards them. But from a distance, that is not such an easy task. In very general terms, we can say that the way forward in all the ALBA countries will be found in popular mobilisations at the base. Political tendencies which base themselves on the developing organs of popular control, in the neighbourhoods and workplaces, are the only long-term alternative in all the ALBA countries. It is also very clear that no break from imperialism will be possible which is not deeply rooted in Indigenous sovereignty. But we need to be absolutely clear, for us in the global North, these are not the key issues. We won't be the ones addressing and solving them. That task will of course fall to the workers and campesinos inside the ALBA countries themselves. Our job is to know the importance of the push-back to imperialism represented by the ALBA countries and the grim seriousness of our states in their determination to reverse this process. Our job is to build solidarity with the ALBA countries against attacks from the United States and Canada. To the extent we can do that, we can modestly increase the space for the struggles against neoliberalism, unfolding in Latin America and the Caribbean. This task is not easy. In Canada and the US, there is a virtual blanket of silence around the enormous movements against imperialism which have broken through in Latin America and the Caribbean. We need education to demonstrate the importance of the struggles in Latin America and the Caribbean. We need to encourage worker-to-worker and student-to-student exchange programs, so that we can see for ourselves the challenges and possibilities in Latin America and the Caribbean. All of this, done properly, will lay the basis for a bigger solidarity movement should there be a sixth coup d’état attempt in the months to come. This is not an act of charity. It was the poor of Cochabamba in Bolivia who, 10 years ago, rose up and defeated the privatisation of water in their region – the first big victory against privatisation in all the Americas. It was the masses of Latin America and the Caribbean who defeated the Free Trade Area of the Americas in 2005. It was the new government of Bolivia which convened the alternative conference on climate justice – again in Cochabamba – after the Global North failed miserably in Copenhagen. In every sense of the word, their struggle is our struggle. Nov. 13, 9:30am–5pm: Teach-in, “From Cochabamba to Cancûn: Building a Movement for Climate Justice”, with Keynote speaker Erika Duenãs, Bolivia Chargé d’Affaires, Washington D.C.
 Álvaro Vargas Llosa. “Ecuador police protest was no attempted coup.” The Australian. October 7, 2010. European Union Election Observation Mission. “Ecuador Final Report: Presidential and Parliamentary Elections – 26 April 2009.” June 8, 2009. Max Fisher. “Fallout of Failed Coup in Ecuador.” The AtlanticWire. October 1, 2010. Atilio A. Boron. “A Note About the Failed Coup in Ecuador.” Translation: David Brookbank. October 3, 2010. Alexander Martinez. 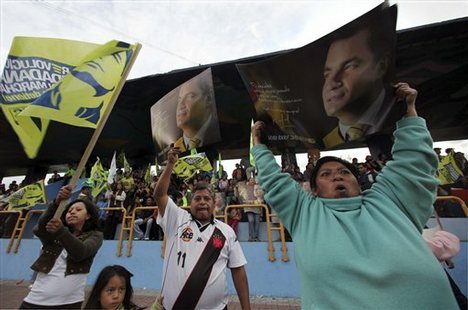 “Correa declares victory over rebel forces in Ecuador.” AFP, October 2, 2010. Wayne Madsen. “Obama administration fingerprints on Ecuador coup attempt.” voltairenet.org. October 3, 2010. Mark Weisbrot. “Ecuador: Coup attempt encouraged by Washington.” Links: International Journal of Socialist Renewal. October 1, 2010. “Venezuela to Build New Refinery in Ecuador.” voltairenet.org. June 5, 2006. “Ecuador defaults on foreign debt.” BBC News. December 13, 2008. Mankh (Walter E. Harris III). “‘South of the Border’ Documentary Film Review.” Axis of Logic. October 6, 2010. Federico Fuentes and Stuart Munckton. “Bolivia: Fascist right launches ‘civic coup.’” Green Left Weekly. September 13, 2008. Federico Fuentes. “Venezuela: Left wins, but right makes gains.” Green Left Weekly. October 2, 2010. Much of this analysis is based on discussions which took place at a seminar in Toronto. Raul Burbano, Nicolas Lopez. "VenezuelaVotes: Eyewitness to a People in Struggle." Venezuela With You Coalition (CVEC), Barrio Nuevo and Centre for Social Justice. Toronto. October 3, 2010. Marlon Santi. “The Alleged Coup d’Etat, Democracy, and the Indigenous Organizations.” In Al Giordano. “Statement by Ecuador’s Most Important Social Movements.” The Field. October 6, 2010. Jennifer Moore. “Ecuador: CONAIE and Correa Begin Dialogue.” Upside Down World: Covering Activism and Politics in Latin America. 6 October, 2009. In the original version, this read as follows: “And Correa has not always been an easy president to defend. In June, in response to CONAIE protesters, he was quoted as saying: "These people are gringos who are coming here with NGOs. Take it somewhere else. These people’s stomachs are full enough." (Telesur TV, source: www.telesurtv.net, 25 June 2010. Cited in Raúl Zibechi. “Bolivia and Ecuador: The State against the Indigenous People.” Amazon Watch. 19 July, 2010. Thanks to Martin Huber who pointed out that Zibechi’s quotation is distorted and taken out of context. For those who want to check, the original can be found at Telesur. “Correa insta a sacar de la pobreza a pueblos ancestrales de América Latina." www.telesurtv.net. 25 June, 2010. The main point of the paragraph remains, however. There have been tense relations between CONAIE and Correa, and CONAIE does have legitimate grievances.